ASRock cooperated with Creative to introduce the Game Blaster, a new audio card with Broadcom Gigabit LAN. It's a proprietary product though, it's only supported by ASRock's X79 based motherboards. Pricing and availability is unknown. 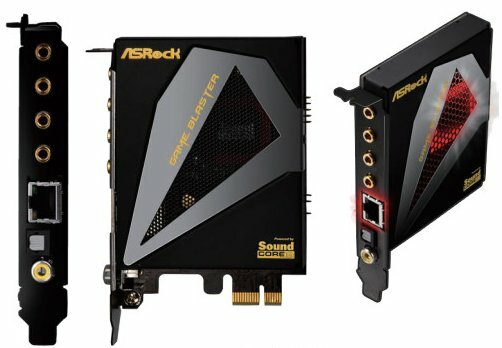 World's top 3 motherboard manufacturer, ASRock Inc., specially partners with Creative Technology Ltd, the worldwide leader in digital entertainment products for the personal computer, to introduce the most trusted sound card in mobo industry - Game Blaster! Gamers need so much more from their rigs. ASRock Game Blaster was designed to exceed the expectations of even the most dedicated gamer. It is the first sound card coming with both Creative 7.1 CH HD Sound Core3D Audio and Broadcom Gigabit LAN in the world. Powered by Sound Core3D™ quad-core audio and voice processor, the revolutionary Game Blaster delivers the first-class sound experience to extreme gamers! This breakthrough audio chip even brings some exciting features, allowing gamers to enjoy pure gaming audio, such as THX TruStudio PRO™ sound technologies, CrystalVoice™ and EAX 1.0 to 5.0 solid sound technologies. ASRock Game Blaster was unprecedentedly equipped with a Broadcom Gigabit LAN. Broadcom Gigabit LAN not only focuses on high performance, but also ensures extremely low power consumption to enhance eco-friendly environment. Coupled with Game Blaster and ASRock motherboard, serious gamers will get benefits of 2 LAN supports. Connected 2 LANs together, users can enjoy Dual PCIE Gigabit LAN feature with teaming function effortlessly. ASRock Game Blaster is setting a whole new standard for gaming audio. It's been designed for incredible sound experience and precise accuracy. The ASRock Game Blaster has lots intelligent features including Creative Sound Core3D single audio chip with Scout Mode™ and Broadcom Gigabit LAN. It's aimed to unleash the maximum gaming performance.